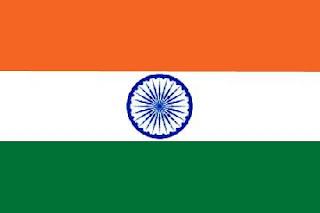 Oh, I think its time I've to be more optimistic about India on the global sport arena. Seeing what this young man, Abhinav Bindra has done on the world's biggest stage, I feel (and hope) India is going to feature more prominently & consistently on the Olympic medal list. First of all whole hearted congrats to Abhinav! 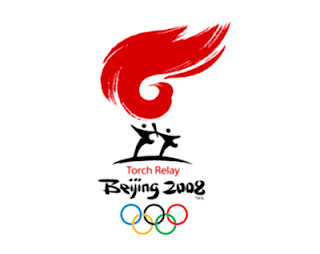 Words cant express the gratitude to you, the lone man standing among the Indian ruins of Beijing 2008. Watching this video has been overwhelmingly emotional..Honestly, I never felt such an overflowing sense of patriotism, pride and euphoria, anytime in the 27 years of my existence, as seeing the Tricolour rising against the background of the National Anthem. As always the sports-lovers of the country believe that this is going to change the fortunes of the cruelly neglected, mismanaged and corrupt sports arena in India. Dirty politics, chicanery, inefficiency and all sorts of synonyms you could think of, plague the respective sports regulatory bodies. We have illustrations all around us, and sports (except for cricket) take the backstage in Indian administrator's books. A glimpse at the success story of Abhinav Bindra is a testimonial. He took up shooting seriously as a competition event in his early childhood and had the support of his affluent family. Abhinav also had the luxury of practicing in his personal air-conditioned shooting range at his Chandigarh home. This facility was fitted with all world class equipments including imported rifles, computer analytic system and other essential amenities. Shooting is always a very expensive sport to pursue, which only the rich and affluent could afford. Abhinav and Gagan Narang have financially strong family backgrounds whereas Rajyavardhan Rathore is a high ranking Army personal. But what about those events which requires broader support and grooming from grassroot levels? The Hockey debacle has led to one of the major purification of the ruling body with the super-cop turned sports administrator KPS Gill and his footlickers shown the door, ending his 14 years of misrule. The next pest in firing line must be the Indian Olympic Association(IOA) President Mr. Suresh Kalmadi, who've been at the helm since 1996. The latest parasitic infestation of Sports Governing bodies by politicians is of BCCI by the useless Sarad Pawar, who doesn't even know how to hold a cricket bat. This political interference is not the only cause of the Indian debacles on World stages. The ones in charge seems least bothered about the complete lack of Infrastructure at community levels. How do you unearth and harness talents if you don't have the necessary framework to mould it? 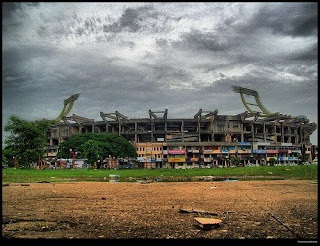 The sad state of the G. V. Raja Sports School in Trivandrum explains it all. The school, dedicated to sports development, doesn't even have a clay track for its athletes(dreaming of a Synthetic track is like going to Mars). The long jump pit has more gravels than sand and a swimming pool exists only as drawings. Is there no end to this farce? India will be second to none in the Global sports stage if adequate money and willpower is instilled into attracting and grooming the raw talents in the nation's heartlands. But with pests like Kalmadia and clueless administrators like sports Minister M. S. Gill reigning, the light appears far. A touch more effort from the administrators would've seen boxers like Akhil Kumar stepping up on the Olympic podium to glorify the nation. Akhil, who had to choose between his food and boxing gloves, is a reflection to the state of affairs of our sportsmen. How long will a person be able to keep the passion in him against the fire in his stomach? Which parent will be allowing his child to pursue a career in Sports, risking the kids life and a chance to live well? We've enough and more examples of sportsmen who struggled for a livelihood just because they became professional sportsmen... Vijayan, Pappachan, Satyan...They got nothing other than empty promises and broken careers. How long will we go on with one Cricket and self-built successes like Abhinav? 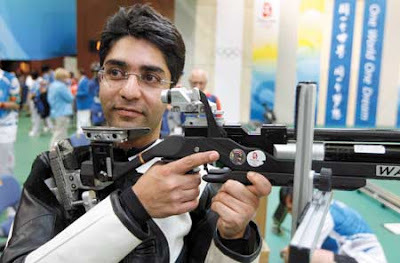 PS: If you wish to relay your personal greetings to Abhinav Bindra, log on to his blog http://abhinavbindra.blogspot.com/ . A really good role model for the youth...educated, humble, self-controlled, sportsman, businessman and familyman! May be like what Raymonds have been searching for all these years...the complete man.